Vertical Vocal Dispersion: Although the dispersion characteristics of any singer are complex, there is a trend for high-frequencies to bounce off the palate in a downwards direction, such that miking positions below the nose are brighter and more forward-sounding. You can hear this for yourself in the following recordings simultaneously captured with three identical Avantone CK1 microphones (with their cardioid capsules fitted) all placed roughly 20cm from the singer's mouth: the first mic was roughly 45 degrees above the line of sight (Ex04.01:WAV/MP3 ), the second mic was directly in front of the nose (Ex04.02:WAV/MP3 ), and the third mic was roughly 30 degrees below the line of sight (Ex04.03:WAV/MP3 ). Horizontal Vocal Dispersion: Because of natural physiological asymmetry, most vocalists don't put out the same frequency balance on both sides of their face. You can hear this in the following audio examples, simultaneously recorded with three identical Avantone CK1 microphones (using their cardioid capsules) all placed roughly 20cm from the singer's mouth: the first mic was roughly 30 degrees to the left of centre (Ex04.04:WAV/MP3 ), the second mic was centrally placed (Ex04.05:WAV/MP3 ), and the third mic was 30 degrees right of centre (Ex04.06:WAV/MP3 ). Sibilance & Mic Technique: Overbearing sibilance is an ever-present concern when recording vocals, so mic positions directly on the level of the mouth (Ex04.07:WAV/MP3 ) are usually ill-advised. Some engineers assert that the 'pencil trick' is an effective remedy (Ex04.08:WAV/MP3 ), but in my experience repositioning the microphone above the plane of the lips (Ex04.09:WAV/MP3 ) is equally, if not more, effective. Plosives & Mic Technique: Mic positions directly on-axis to the singer's mouth (Ex04.10:WAV/MP3 ) tend to suffer from plosive blasts, something the 'pencil trick' is all but powerless to protect against (Ex04.11:WAV/MP3 ). A more effective solution is to use a pop shield (Ex04.12:WAV/MP3 ), although some engineers feel that this negatively impacts the rest of the vocal timbre. The Timbral Effects Of Miking Distance: The biggest timbral changes when changing miking distance with a cardioid microphone are connected with microphone's proximity-effect bass boost, but more subtle tonal shifts also occur in the midrange, as you can hear in the following examples, which were all simultaneously recorded from slightly above the line of the singer's nose using three identical Avantone CK1 microphones with their cardioid capsules fitted: the closest mic was 12cm away from the singer's mouth (Ex04.13:WAV/MP3 ), the middle-distance mic was 20cm away (Ex04.14:WAV/MP3 ), and the farthest mic was 28cm away (Ex04.15:WAV/MP3 ). Vocal Microphone Shootouts: Here are the audio files from one of many microphone shootouts I've carried out during CMT recording workshops. In this case, a single vocalist tried out 11 different microphones, each mic recorded as a separate pass, capturing the singer from the same miking position. The mics were: an AKG C414B-XLS large-diaphragm condenser mic operating in cardioid mode (Ex04.16:WAV/MP3 ); a Brauner Valvet large-diaphragm valve mic operating in subcardioid mode (Ex04.17:WAV/MP3 ); a CAD M179 large-diaphragm condenser mic operating in cardioid mode (Ex04.18:WAV/MP3 ); an MXL V77S large-diaphragm cardioid valve mic (Ex04.19:WAV/MP3 ); a Rode NT1 large-diaphragm cardioid condenser mic (Ex04.20:WAV/MP3 ); a Rode NT1A large-diaphragm cardioid condenser mic (Ex04.21:WAV/MP3 ); a Samson C03 large-diaphragm cardioid condenser mic (Ex04.22:WAV/MP3 ); an SE Electronics SE1A small-diaphragm cardioid condenser mic (Ex04.23:WAV/MP3 ); an SE Electronics Z3300A large-diarphragm condenser microphone operating in cardioid mode (Ex04.24:WAV/MP3 ); a Shure SM58 cardioid dynamic mic (Ex04.25:WAV/MP3 ); and a Shure KSM137 small-diaphragm cardioid condenser mic (Ex04.26:WAV/MP3 ). For another good vocal-mic shootout, check out this Sound On Sound magazine article: 'Vocal Mics: Matching Mics & Voices'. I also highly recommend the 3D Audio mic shootout compilations: 3D Mic CD and Ribbon Roundup CD. Backing-track Stems For Overdubbing Practice: If you don't have a project in progress suitable for the overdubbing Assignments in this chapter, then check out the 'Recording Secrets' Free Backing Stems Download Library for a range of projects in different styles, complete with accompanying cue/comp/lyric sheets and vocal guide parts. Polarity & Phase Adjustments For Headphone Foldback: On page 136, I mention that the bone-conducted sound of a singer will comb-filter against their headphone foldback signal if there's any monitoring latency, and that this can cause all sorts of pitching and performance difficulties. As such, I recommended using true zero-latency (ie. analogue or acoustic) monitoring wherever possible. However, what I didn't point out was that if you're in a situation where some monitoring latency is unavoidable, you can still improve the singer's listening experience by finessing the nature of the comb-filtering. The simplest method is to hit the polarity-inversion switch on your mic preamp (or on the vocal channel in your recording software), which will change the nature of the comb-filtering, quite possibly making it more benign in practice. Alternatively, if you wanted further control over the comb-filtering sound, you could use a variable phase adjuster instead. Some Mic-mounting Hardware Recommendations: Although they're far from being the cheapest option, I've personally invested in K&M mic stands, because they're extremely solidly built and there's a full range of spare parts available if something breaks. They also do all manner of related widgets, such as these 3/8-inch-to-5/8-inch and 5/8-inch-to-3/8-inch mic-stand thread adaptors, swivel-joints, and a neat retro-fit drop-arm. If you need better shockmounting for your choice of vocal mic, then check out Rycote's InVision series of universal suspension shockmounts, which are extremely effective. DIY Mic-mounts From PVC Plumbing Fittings: A very neat and budget-friendly trick from the LFR Studio blog is to build custom mic-mounting devices from cheap PVC plumbing supplies. To get a better idea how it works, check out the supplied example-project video. Mini-mixers For Zero-latency Monitoring With Comfort Effects: If you already have a hardware effects unit, then check out the Alesis MultiMix 4 USB and the Behringer Xenyx 802. Alternatively, both companies also have models with built-in effects processing for added convenience: the Alesis MultiMix 4 USB FX and the Behringer Xenyx 1002FX. Acoustics Products: Auralex sell all manner of tried-and-tested acoustic foam products for reducing the problems of early reflections. GIK Acoustics and Real Traps sell a variety of ready-made mineral-fibre bass traps for dealing with lower-frequency room resonances, but if you fancy saving some money by making your own, then check out the DIY wooden frames available from ATS Acoustics and Acoustimac -- the latter also do 'DIY EZ Wraps', which are bags prefabricated from acoustic fabric to fit standard 2x4-foot mineral-wool slabs. Acoustic Treatment & Soundproofing: There's tons of great information about acoustic treatment and soundproofing for small studios in the Sound On Sound magazine article archives. Here's my pick of the crop: 'A Beginner's Guide To Acoustic Treatment'; The Studio SOS Guide To Monitoring & Acoustic Treatment'; Room For Improvement'; 'Practical Soundproofing'; 'Practical Acoustic Treatment' (Part 1; Part 2; Part 3; Part 4; Part 5); 'Practical Studio Soundproofing' (Part 1; Part 2; Part 3; Part 4); . Phase & Polarity: If the box in Section 4.4.1 left you wanting a more detailed discussion of the role of phase and signal polarity in studio situations, here's a big Sound On Sound magazine article I wrote on the subject, which has explanatory diagrams and lots of practical case-studies. Compression: Here's a fairly entry-level Sound On Sound magazine article on compression: 'Compression Made Easy' -- although it's focused more on mixing, exactly the same principles apply when recording. For more in-depth discussion of specific compressor parameters, try this two-part Sound On Sound 'Advanced Compression Techniques' series: Part 1; Part 2. No idea which compressor plug-in to dial up? Here are some suggestions based on professional usage of classic models: 'Choosing The Right Compressor For The Job'. Microphones: If you're looking for more general information about microphone design, here are some Sound On Sound magazine articles that you might want to check out in the first instance: 'Capacitor Microphones Explained'; 'A Guide To Choosing & Using Studio Microphones'; Understanding & Using Directional Microphones'. For more in-depth information, there are few sources as informative and authoritative than John Eargle's The Microphone Book, which I highly recommend, and the Microphone Data and Recording Hacks sites are also essential resources. 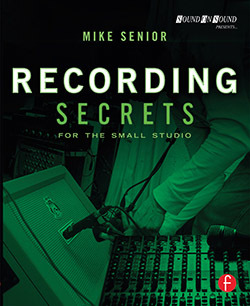 Microphone Preamps: On page 146 of the book, I assert that the differences between microphone preamps are so subtle that spending large amounts on high-end units represents questionable value for money in most small studios, because differences between microphones (and indeed microphone placements) make a much more significant impact. There are masses of audio examples demonstrating the sounds of different mics and mic positions on here on this very site, but if you'd also like to compare some different preamps to make up your own mind on this issue, then check out the excellent blind-test carried out by Sound On Sound magazine, comprising this introductory article, these anonymised audio files, this blind-test forum discussion, and this follow-up article. For further perspective, check out 3D Audio's range of comparison CDs, which feature wide-ranging shootouts of microphones, preamps, and A-D converters. Vocal Warm-up Exercises: Here's a nice little list of warm-up exercises with accompanying audio examples, courtesy of TheSingingVoice.com.